Former Washington State University football player Robert Barber, whose summertime melee and subsequent expulsion led to calls for the university to review its student conduct policy, now faces a felony assault charge. Prosecutors charged the former defensive lineman this week with punching another WSU student. He is due in court March 17. Deputy Whitman County Prosecutor Dan LeBeau received the case file in October and said it included more witness interviews than any case he’d ever handled in his career. Barber, who has already graduated from WSU, was charged in connection with a July 23 fight captured on cellphone video. It shows him punching the other student from behind. Witnesses claimed Barber then struck the man a second time after he was down, causing a concussion. Barber and Toso “T.J.” Fehoko were arrested Sept. 16 in connection with a fight in which another man suffered a broken jaw. LeBeau declined to charge Fehoko, who is no longer on the WSU football team. “I just didn’t have enough evidence to prove it beyond a reasonable doubt,” LeBeau said of the investigation into Fehoko. 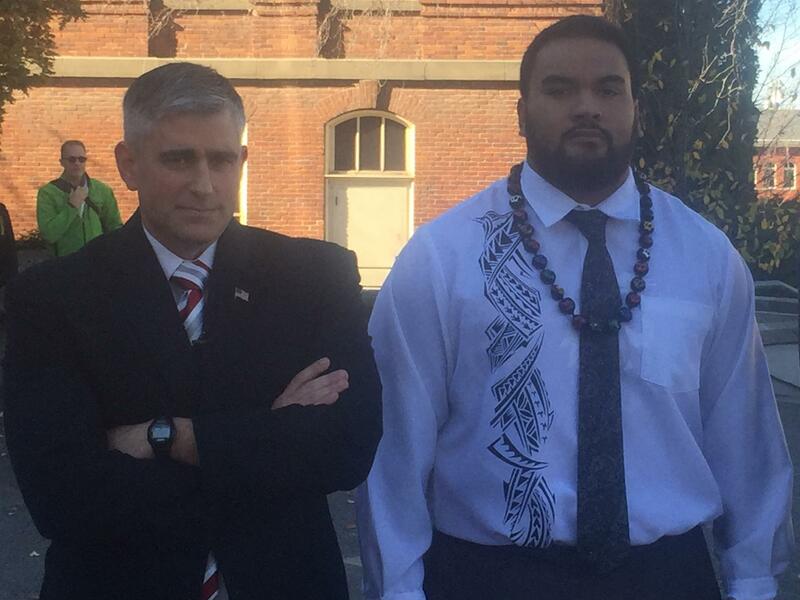 After both players were arrested, the WSU Student Conduct Board expelled Barber. That expulsion sparked an outcry, with football fans and state Sen. Michael Baumgartner, R-Spokane, pushing to reform the Student Conduct Code process. Baumgartner rallied to Barber’s defense and demanded WSU administrators intervene: “If the university doesn’t want to fix it, we’ll fix it for them in the Legislature,” he said Oct. 31. The case got even more complicated when Whitman County Superior Court Judge David Frazier sided with Barber’s attorney and shelved the football player’s expulsion. The decision allowed Barber to play in WSU’s last two regular season games as well as in the team’s loss to Minnesota in the Holiday Bowl. Barber then graduated in December. Frazier’s ruling centered on the fact that WSU’s Student Conduct Board destroyed evidence of questions submitted by Barber and for paraphrasing those questions. WSU President Kirk Schulz then hired an outside legal firm to review the conduct board process. University spokesman Rob Strenge said that report is due as early as next week. Published: Feb. 24, 2017, 2:24 p.m. Updated: Feb. 24, 2017, 10:35 p.m.